Isn’t this a sweet picture? 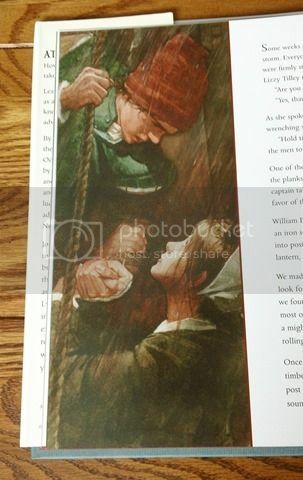 It’s from the beautifully illustrated book, The Boy Who Fell Off the Mayflower, by P.J. Lynch, who also did the artwork. The “boy” was John Howland, and “Lizzy” was Elizabeth Tilley. They were my 9x great-grandparents. In the book, John tells the story, and this excerpt goes with the picture. Some weeks out from England, we were caught in a really cruel storm. Everyone held tight to a rope or a bulkhead, and the little ‘uns were firmly strapped in. Of a sudden, the ship reeled right over, and Lizzy Tilley rolled out of a bunk and landed at my feet. “Are you all right, miss?” I said, helping her up. So Lizzy Tilley knew my name. I bought each of my kids and adult grandkids a copy of the book. It’s a children’s book (ages 8 and up), but we grownups like it too. You are related to my husband! 1. You are related to my husband! He's always enjoyed the story of his ancestor who fell off the Mayflower but could never remember the name that his mother had told him. I just looked at my tree and John Howland, who was married to Elizabeth Tilley, is in his line! I'll have to get a copy of that book for him - and one for each of our grandnephews, too! You are right, that is a wonderful picture. John and Elizabeth had 10 children and more than 80 grandchildren. They're believed to have more than a million living descendants, more than any other Mayflower passengers. Knowing that makes me feel quite special, lol. Greetings to your husband, my new-found cousin! John Howland is his 9th great grandfather. His line comes down through Desire Howland who married John Gorham, then through the Lathrop, Bacon, Lyon and Cleveland families. I'll tell him you said hello! 4. My 9th great-grandfather too.